From cactus to grapefruit, MCC alums got it covered. Cory Brownsten, Tim Redding and Patrick Urckfitz will spend February and March honing their wares at spring training facilities in Florida and Arizona. Brownsten will report on February 17th to the Atlanta Braves’ Wide World of Sports complex in Orlando, Florida. Urckfitz heads to the Houston Astros’ facility in Kissimmee, Florida. Redding will spend his spring at Camelback Ranch, the Los Angeles Dodgers’ site in Glendale Arizona. After suffering a small meniscus tear in his second at bat of fall instructional league, Brownsten will re-hab for the first two weeks of spring training. 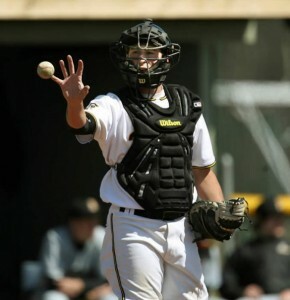 The Atlanta Braves chose Brownsten in the 15th round with the 464th pick of the 2010 draft. In 34 Gulf Coast League games, the catcher hit .287 with two home runs and 14 RBI. Brownsten earned a late season call-up to play one game with the Danville Braves of the Appalachian League. He went 3-4 with a team-high five RBI to close out the campaign. In his sophomore season with the Tribunes, Brownsten earned Junior College D2 Defensive-Player-of-the-Year honors to go with a Gold Glove. He garnered first-team All-American, All-District and All-Region honors hitting .390 with seven home runs, 50 RBI and a slugging percentage of .615. MCC finished the 2008 season third in the nation. Brownsten went on to play at the University of Pittsburgh where he earned All-Big East honors hitting .395 with 17 extra-base hits, including three home runs and 48 RBI. The right-handed hitter walked 16 times, stole three bases in six attempts and finished with a slugging percentage of .530. Urckfitz reports with the Astros pitchers and catchers on February 16th. He has tossed over 186 innings in three seasons in the Astros farm system striking out 179 while walking just 60 to go with an ERA of 3.42. 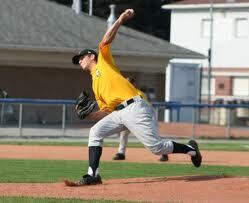 He will compete for a spot with the Corpus Christi Hooks of the Double-A Texas League where he finished last season. The lefty nearly doubled his innings pitched last summer throwing over 104 frames for the Lancaster Jethawks of the Class A Advanced California League before the late-season call up to the Hooks. He finished 2010 with a spot in the prestigious Arizona Fall League. Urckfitz pitched went 1-0 in nine appearances for the Peoria Javelinas. He struck out eight and walked four in 11.2 innings earning a spot in the Rising Stars game. Urckfitz struck out one of the two batters he faced in the showcase game. Urckfitz led the 2009 Lexington Legends of the Class A South Atlantic League in appearances (42) and saves (13). In 49 innings of work, he compiled a 4-1 record with a 2.57 ERA while striking out 42 and walking 13 and earned Legends’ Pitcher-of-the-Month honors for May going 1-0 with four saves with 0.71 ERA for the month. He finished the year hurling 57.2 innings. He signed as a free agent with the Astros in 2008 after fanning 25 in 14.2 innings of work for the 2008 Webster Yankees of the New York Collegiate Baseball League. Urckfitz made 15 appearances for the 2008 Tribs. He tossed 11.3 innings of relief in NJCAA World Series surrendering just one run while striking out 15 to earn All-Tournament team. Redding signed a minor league contract with the Dodgers. The 13-year veteran has logged over 800 innings of work at the major league level fanning 552 in that time. Twice Redding has notched double-digit wins getting 10 each with the 2003 Astros and 2008 Washington Nationals. Redding also has 71 wins at the minor league level. Redding’s 16 career victories rank second all-time in Tribune history. In 1997, he earned third-team NJCAA D1 All-American honors with 10 wins and an E.R.A of 1.02. Both numbers top the MCC lists for those respective categories. The Churchville, New York native was taken in the 20th round by the Astros and was the M.V.P of the Florida State League in 2000 and the Texas League in 2001. Redding was inducted into the MCC Hall-of-Fame in 2008. Both the Cactus and Grapefruit League play open on February 25th. 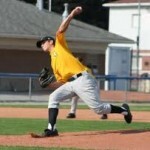 The Tribunes open the 2011 season with 12 games in Arizona starting on March 11th. One Response to "Trio of former Tribs eye spring training"
It’s really hard to believe Tim Redding is only 33…tomorrow. Happy Birthday Tim Redding! Good luck in Arizona.